Igave my son these speakers a few years ago and recently borrowed them, they sound great. Does anyone know anything about them?.. age ...price . Ican't find ANY information on them, just curious. are those the triangular-shaped ones sold by AR and later by Advent? Also called Powered Partners? Or is that an entirely different animal? 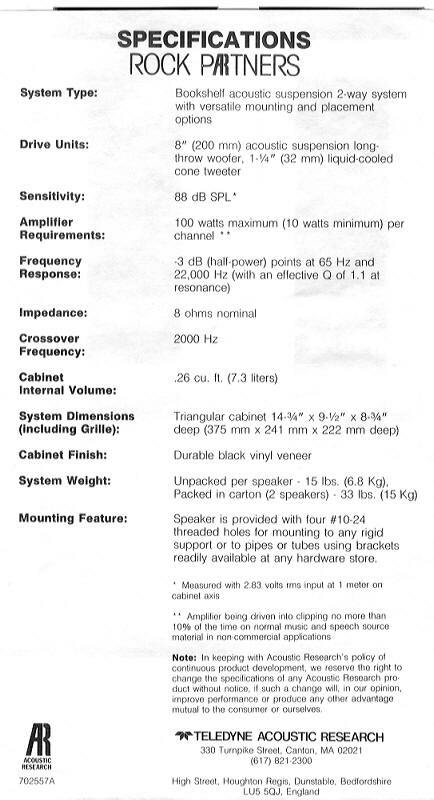 They have an 8" woofer, 1½" tweeter, frequency response is 35-20,000 Hz with 100 watts continuous power (200 watts peak). They measure (upright) 15" high in front, 6" in back x 9½" wide x 11½" deep. Use them alone or as rear speakers on a surround sound system. With their unique design, you can stack them or stand them upright. The AR Rock Partners (sometimes referred to as the AR AV-18), can perhaps be considered as the final (shape-shifted) iteration of the AR18/AR18s/AR18b/AR18LS series, with a noble lineage that can be traced back to the AR-7. 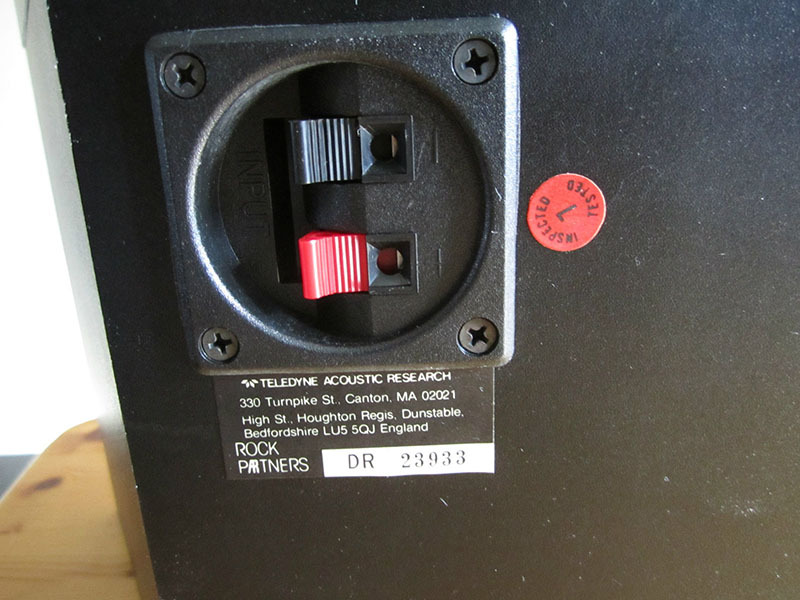 They use very similar components (the '37 woofer and '38 tweeter) and are often sought as a source for replacement drivers for the AR18s, in particular the tweeters. (The woofer foam surrounds seem particularly robust, and can often be found with many years of life still left in them.) Suggested retail, in 1986, was around $250 per pair. "These classic speakers are one of the few ever produced to be praised and respected among Hi-Fi enthusiasts and professional studio engineers alike. The AR18s was consistently rated as a "best buy" by the UK Hi-Fi press and formed the basis of many a classic system. These deceptively simple and compact speakers give a big, fast and detailed sound that belies their diminutive stature and modest cost. The exceptional performance of the AR18 and its relative insensitivity to room acoustics and placement made it a natural choice for sound engineers who couldn't live with the overly brash sound of the then industry standard Yamaha NS-10. The AR18 was famously used and recommended by such respected engineers as Hugh Padgham (Phil Collins, Police, David Bowie etc.) and can still be found today in facilities such as George Martin's Air Studios. Compared to the NS10 or later NS10m, the AR18s scores in pretty much all respects. It is smoother, yet more detailed. It's bass is fuller and better extended. It's overall response is far flatter. Stereo imaging is better. Dynamics are excellent and at least the equal of the NS10. Compared to most modern budget studio monitors (think Tannoy Reveal, Spirit Absolute 2 etc.) the AR18s are faster, more natural and tighter in the bass. This is due to the use of good old-fashioned paper cones, extremely simple crossover and AR's Acoustic Suspension (or sealed box) design. Modern reflex (ported) designs may have more bass at first listen, but the bass rolls off steeply when it reaches its limit. I would never use a small ported speaker for critical monitoring as you just can't tell what's going on in the bass below a certain point. As a Hi-Fi speaker the AR18 is best described as seriously funky. They're just one of those speakers that always gets your feet tapping. They may not match the very best in terms of detail or resolution, but they always sound big, fast and full-bodied yet well-balanced. Plus I've never found a room that they don't work in. Over the years I've had 4 pairs of AR18s and always loved them, either as Hi-Fi speakers or monitors in my studio setup. They are relatively unfussy about the amplifier driving them, but that said it's definitely a case of rubbish in, rubbish out."